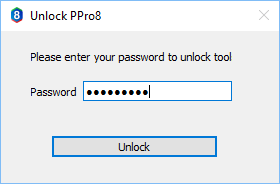 Use the PPro8 Lock/Unlock tool to password lock the PPro8 client, then unlock to use it again. 1. On the PPro8 toolbar, click LockUnlock. 2. PPro8 is locked, and all windows are hidden. 2. The Unlock PPro8 window appears. 3. Type your PPro8 password in the Password field, and then click Unlock. 4. 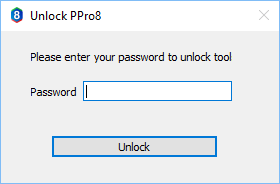 PPro8 is unlocked, and all windows appear.